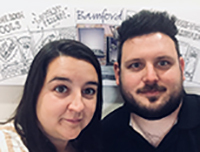 We became partners in the business in late 2017 with the ambition to continue the excellent customer service whilst moving Bamford Trading forward into the future. Our team work very hard to process, pick, pack and despatch all of the orders we receive. Making sure we have the best selection of items available and delivering our very best customer experience.